If you’ve been massaging your feet and have found tender or sensitive areas, there’s a reason why this happens. When you have sensitive points on your feet, there are four possible causes, which can give you insights into your health and well-being. These points can also give you a heads-up to let you know that you need to make changes before you experience health issues. Your feet are a microcosm of your body—they reveal what’s going on at the energy level. 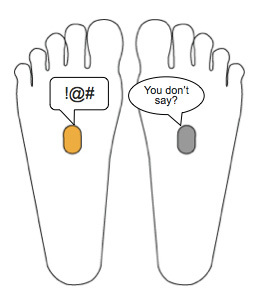 When you find a sensitive point on your foot, it lets you know if there is an energy block or disharmony in your body. In Traditional Chinese Medicine, a physically healthy body depends on the smooth and abundant flow of qi (life force energy) through the energy meridians of the body. Similar to the circulatory system for blood, you have a network of energy channels for circulating qi in your body. If a point on your foot is sensitive, then you know that there is an energy disharmony in the area of the body that corresponds to the reflexology point. If you are currently experiencing an ailment or discomfort in your body, it will show up as a sensitive point on your foot. For example, if you had a sore throat, then your throat point would be more sensitive than normal. Or, if you woke up with a crick in your shoulder, then your shoulder reflexology point would be sore when you pressed on it. After a short-term issue passes, your points will no longer feel as sensitive and will return to their normal levels of sensitivity. That’s why it’s good to determine a baseline rating for the sensitivity of your reflexology points. A baseline rating can tell you if there are any significant changes happening that you should pay attention to. A good example of something new—a sudden illness showing up in the feet—was when my son got the stomach flu. He’s generally very healthy, and he eats well and gets a good amount of exercise. As a result, he never has sensitive points on his feet unless he’s sick. Several weeks ago, he caught a stomach bug at school. He threw up his dinner and vomited a few more times during the evening. When I massaged his stomach points, he complained about how much they hurt. Normally, these points on his feet are not the least bit sensitive. However, each time I massaged his feet in the evening (he woke up around midnight and had to throw up a again—poor little guy), the points hurt a lot. This was indicative of the energy disharmony he was currently experiencing in his stomach. In this video, my son talks about the changes in the sensitivity level of his Stomach point during and after the stomach flu. He also talks about his stuffed monkey :). In the morning, his reflexology points were no longer sensitive. And indeed, his physical symptoms were much improved, too. He ate breakfast, it stayed down, and he no longer had any pain or queasiness in his stomach. By the end of the day, he was fully recovered and chowing down heartily on dinner. If you have an old shoulder injury, this would show up as a sensitive point on the shoulder reflexology area of your foot. For example, scar tissue in the shoulder could create an obstruction to the smooth flow of energy through the area. As a result, your shoulder point would be sensitive. With something old, it is also possible for a problem to be resolved physically, but still have an energetic disharmony remaining. For example, perhaps your shoulder is fine, but you always “baby” it because you feel overly conscientious about protecting it. In this case, your thoughts could cause an energy disharmony because you may subconsciously tense up whenever you think of your shoulder. In addition, when you have negative thoughts and feelings towards a particular area in your body, this disrupts the smooth flow of qi through the area. Fortunately, when you regularly massage the right combination of Chinese Reflexology points and address the underlying thought patterns and emotions, you can clear energy disharmonies from past injuries and ailments. If something has been going on in your physical body for a long time—whether it be months or years—it would show up in the corresponding Chinese Reflexology points in your feet. You would have a sensitive point directly related to the affected area, and you would also have sensitive points for the energy meridians that are out of balance, and at the root of the chronic condition in your body. For example, if you had back pain, then your lower back point would be sore. But if your lower backache was related to weakness in the Kidney meridian, then your Kidney point would be sore, too. Here’s where it gets really interesting because points on your feet can be sensitive even if there is nothing going on physically in your body. In the early stages, qi disruptions do not show up in the body because they’re only at the energy level. The disharmony has yet to manifest at the physical level—so this is when something has yet to unfold. This is the most important stage of an energy disharmony because you can turn things around relatively easily at this stage before it becomes a physical problem. Essentially, you’re heading things off at the pass super early so that you don’t get sick. For example, someone who is under a great deal of stress may hold a lot of tension in their jaw, and this would affect the flow of qi through this area. As a result, the reflexology points for their jaw would be very sensitive. While they might not have any physical issues with their jaw or teeth, if the energy disharmony is allowed to continue, it can manifest at the physical level. How it shows up would depend on what else is going on in the body, as well as their general body constitution. And herein lies the secret to health, vitality, and longevity. When you treat things at the energy level, you can prevent sickness. Chinese Reflexology is a very powerful way to address energy imbalances in the body. Reflexology points on your feet connect with the body’s energy meridians. By massaging your feet, you can help strengthen and restore the natural flow of qi in your body. And when your qi is flowing as it should, this helps your body return to balance at the physical level. If you’d like to get started, sign up for my free online lessons—you’ll get free reflexology charts, as well as a series of mini lessons that teach the basics of Chinese Reflexology and how to uncover energy disharmonies in your body. Simply enter your name and email address in the form below the next paragraph. And if you’re ready for more in-depth learning, I have workshops and programs on Chinese Reflexology, and my new book, Sole Guidance will be released on July 26, 2016. I promise to keep your email confidential and not to share it with anyone. As a full-time mom, I’m much too busy to be spamming people, and I consider excessive emails to be rather uncouth. I promise that the messages you receive will be filled with gems of wisdom to help you and your family stay healthy and thrive. Wishing you and your family amazing health and vitality! I’ve experienced the ‘something yet to unfold’ point, but there was nothing I could do about. My husband was doing my feet and one part was so tender that I jumped back in pain. I’ve never felt pain like that in any area of my foot. I figured out it was my stomach area, but I was completely fine, so I brushed it off. About 6 hours later, I was in the bathroom for the entire night doing all that fun stuff that happens when you have the stomach flu or possibly food poisoning.